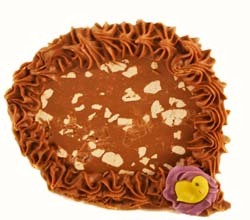 Dorothy's famous melt-away is a smooth, chocolaty confection you are sure to love. We add to it chunks of fresh-roasted pecans. What's not to love? From David Barron of Livermore, California on 4/6/2018 . From Anonymous of Indianapolis, Indiana on 4/27/2014 . From Linda of N Versailles, Pennsylvania on 3/22/2012 .